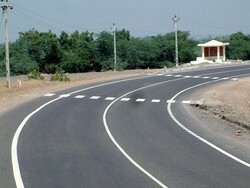 We are a leading Manufacturer of water borne acrylic road marking paint and road marking paint from Thane, India. 1 RYOT4 R-Mark is single pack high solid fast drying Water Borne Acrylic Road Marking Paint for application by cold airless spray machine or by brush or roller. It can be reflectorized by use of suitable drop on glass beads. It can be used on bitumen, concrete, chipseal and over previous coating. It is available in yellow, white and black color. It has high color retention and UV. Resistant property. 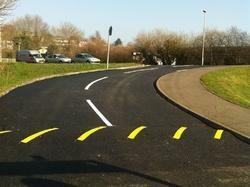 As a significant entity of this domain, we present patrons with the superior quality of Road Marking Paint. Used for road marking applications, the road marking paint is ready to use and is appreciated for its resistance against UV. Valued for its balance composition and enhanced shelf life, the road marketing paint is processed under hygienic conditions.